Mount Merrion Historical Society would like to advise you of our upcoming talk at 8:00pm on Thursday 4th April in Mount Merrion Community Centre. 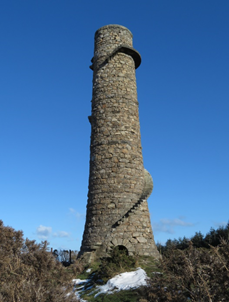 The lead mines chimney at Ballycorus is a well-known landmark on the top of a hill between Shankill, Carrickmines and Kilternan. The hill at Ballycorus is commonly called “the lead mines” and is a popular walking place; it is also the site of extensive remains of lead mining and lead smelting from the nineteenth century. Despite its popular name, the lead mines at Ballycorus were never successful and the principal activity on the hillside and the adjacent valley was the processing of lead ore from elsewhere to make lead products for roofing, paints, shotgun pellets and water pipes. Through most of its history the lead works at Ballycorus smelted lead brought from the Glendalough area, while also bringing lead from Donegal, Wexford and the Isle of Man. Rob Goodbody is a building historian and building conservation consultant. For more than thirty years he has been researching numerous aspects of the history of the Dun Laoghaire-Rathdown area and he has published many works on these topics and on other research subjects. His research on the Ballycorus lead works has taken place over a long period and is shortly to result in the publication of a book on the topic.